The Pinjore Heritage Festival is held every year at Pinjore Haryana. The Fair is an opportunity developed by the government to showcase and highlight the town of Pinjore with its rich heritage, gardens and potential of great tourism. Pinjore is an ancient town developed in Vedic times and is extremely famous for its exotic gardens and tourist attraction. The annual event of Pinjore Heritage Festival is supported by the Haryana Tourism Department and other state bodies in all respect. The Pinjore Festival was started recently, with the first being celebrated in 2006. Yadavindra Garden, one of the oldest and most well maintained Mughal gardens in the world is the venue for the event every year. One of the most unique and attractive feature of the garden is the 7 descending levels of Garden arrangement. Although initially designed during the Mughal era, they have been in various hands, namely the Hill Rulers of Himachal Pradesh, Gorkhas to the royal house of Patiala. Post independence and after the creation of the state of Haryana, the maintenance has been under the Haryana Tourism Department. 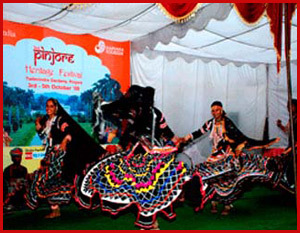 The Pinjore Heritage Festival proudly exhibits the culture and tradition of Haryana. The event is largely a cultural flux, wherein artists from all over India gather to exhibit their art and make the event successful. The Festival is so well planned by the Tourism Department that throughout the event all activities pack the schedule engages the visitors. 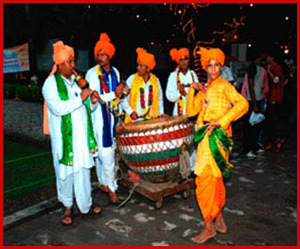 Many attractions such as Garba dance, Folk Dances, Musical concerts, Rock bands, Classical Music, Shopping and food Bazaar provide a wide spectrum to all participants and viewers. The Yadavindra gardens are so beautifully decorated that the complete ambience reflects back to Vedic times and Mughal times. The lighting, decoration, music, dance all culminates to make this a memorable event. The state of Haryana celebrates the rich, glorious culture of India in its various fairs and festivals that are celebrated with equal pomp and gaiety here as all over the country. The unique elaborate culture and traditions of Haryana draws a large number of visitors every year across all seasons to take a flavor of this warm state. There are many fairs and cultural events that find place in the activity calendar of the state. 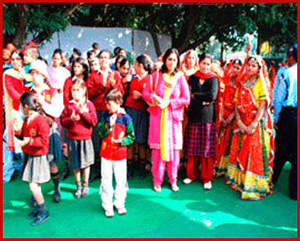 These festivals are occasions of celebration, fun and frolic when the entire state of Haryana bustles with life. The Pinjore Heritage Festival is celebrated every year in the month of October. As the main aim and objective of the festival is to highlight the potential of Pinjore which was slowly fading in remembrance, the event is organized at Pinjore in Haryana.